The Brentwood Centre played host to a fiddle of fine fights this Saturday night as Frank Warren promoted some of his most hotly-tipped talents with Anthony Yarde defending his WBO Inter-Continental belt against, Argentine champion, Walter Sequeira; Gary Corcoran and Johnny Garton went at it for the British Welterweight strap; and Umar Sadiq and Zak Chelli put their unbeaten records on the line over eight rounds. 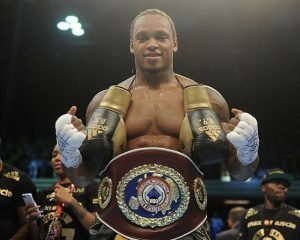 Anthony Yarde, looking to move 17 and 0, was in the ring against Walter Gabriel Sequeira – a man who’s record is composed of 21 wins and 4 losses, although his comprehensive loss to Avni Yilidrim tells you all you need to know – in what was widely expected to be a routine victory. The WBO’s #2 ranked light heavyweight entered the ring just before 23:00 UK time and the Hackney-born man needed to dispatch with his opponent in double-quick time in order to prove he is of the calibre that he is sold as. The Beast looked monstrous in comparison to the visiting fighter – officially 5ft10inches but looking a fair sight smaller than that – and Yarde bounced out of his corner immediately, swaggering into the centre of the ring, throwing out a meaningful jab from early doors. Sequeira offered no genuine counter-artillery during the course of their opening exchanges but was offering some shots back as a reminder of his presence, Yarde controlled the tempo of the fight with a relative ease and, whilst not pushing the cause, was on top of the contest from the off. The Argentine sought to get in close to the body of Yarde at every possible opportunity, working the inside, forcing Yarde to create the space and angles in order to land convincing shots of his own, some strong body shots were landed by the home favourite as a tentative reminder of the power he carries. Three rounds in and Yarde started to up the pressure, landing some strong uppercuts to check the chin of Sequeira before a couple of battering shots to head started to take their toll on the man from Argentina – rather tame and underwhelming stuff, in all honest, if truth be told. “This is the round”, we were told between the third and fourth round, the round for Yarde to look for the finish off the back of a convincing third round but Anthony Yarde got caught up in the clinch far too often, almost refusing to find space of his own, to take a step back and explode into the shots. Having spent a minute trying to paw around to create the angle, he landed a downwards right hand to Sequeira, from the clinch in order to send his man to the canvas before the contest started and Yarde moved through the motions, dropping Sequeria a second time. Up again and a calm, composed shot selection from Yarde with two “big” rights and lefts sending the challenger to the canvas for a third and final time with the contest duly waived off – a stoppage victory, sure, but the underwhelming opposition will do little for his reputation. Yarde looked in control and heavy-handed but not necessarily explosive and dyanamic, a good finish but there’s definitely work to be done. Johnny Garton and Gary Corcoran were the co-main event as the pair faced off for the vacant British welterweight title – Garton, a patient man, had waited nearly three years for this opportunity having been in the shadows of his stablemate Bradley Skeete, who formerly held the belt whilst Corcoran was in the second British title fight of his career. The crowd were bouncy and so were the fighters, looking eager to get to battle as soon as the fight began and both men came to the centre of the ring, boxing busy, and establishing their respective jabs with Garton edging the initial exchanges with solid one-twos. Corcoran, the former world title challenger, was showing grit and standing firm at the centre of the ring – true to his words, Corcoran was delivering on his promise to go toe-to-toe with Garton and was throwing some lovely combinations to the body of The Pexican. Taking a shot to land two, three, four of his own, Corcoran landed good left hooks to the body of Garton before varying up with uppercuts and landed with a dominant flurry in the corner of the rope to sign off the second round in signature fashion. Fights began to erupt in the crowd in what was a boisterous and ferocious atmosphere as the scraps began to turn ugly but, back in the ring, quality work by both men who were doing their best to remain undistracted by events outside of their control and it was Corcoran who continued to land impressive body shots before a heavy shot cut Garton underneath the eye. Garton paid little notice to the nick, walking forward himself and taking advantage of the Corcoran’s lack of head movement, firing in some good shots and ensuring Corcoran wasn’t having it all his own way – only three rounds in and it was shaping up to be a cracker. A former English, Southern Area and IBF European title holder, Garton has been no stranger to pressure fights against an array of strong domestic contenders but it was Corcoran who, arguably, was landing the stronger shots as he pushed Garton to the ropes in a relentless fashion with shot after shot being thrown at the Peckham man. The cleaner work and more crips shots were being landed by Garton but Corcoran was eye-catching in his work, fighting true to his nature and turning the fight into a real battle. This rhythm continued as we neared the middle portions of the fight with both men standing their ground at the centre of the ring – no quarter asked and no quarter given – throwing their shorts and absorbing the punishment that was coming their way. A thrilling bout that ebbed and flowed with both men finding pockets of success, Corcoran the more rugged man whilst Garton looked to piece things together in a calmer fashion. Calmer in this fight, make no mistake, was still ferocious in any other. Garton received a large cut to the head in the sixth round but came out fighting in the seventh as he continued to put together the more composed work. Claret seeped across the face of Garton throughout the round with Corcoran looking to seize his opportunity, rallying with successive shots to the head of Garton but the fight was mainly being fought to the body with both men landing some brilliant punches. Warriors, at the core of it, they kept on coming forward with each and every round, embroiling each other in physical warfare but the shots, as punishing as they were, took little toll on either man with both digging in and continuing the pace they began with. If you were to be hyper-critical you could say Garton looked a little ragged in the eighth round as Corcoran found more openings more angles for success; Garton returned to the safety of the jab whilst Corcoran continued to march forward and throw solid right hands. That criticism could be flipped completely on its head in the following round as Corcoran began to look the more scruffy fighter, conceding ground for the first time in the bout and being beaten to the punch on numerous occasions as Garton simply refused to relent, swinging the full weight of his body into the punches to force Corcoran onto the back foot. Blood now decorated the face of both men, the shorts once white with blue trim and white with red, respectively, were gradually turning a pale shade of pink. After the middle rounds saw Corcoran working his way into the fight and taking the upper-hand, it was Garton that rallied from the ninth round on with storming left hooks seemingly landing at will to snap the head back of his younger opponent but, regardless, Corcoran kept on coming back with fire of his own to keep Garton in check. Stunning work, simply sensational work from both men who were showing just what the Lonsdale belt means to these guys in a fight full of heart that and as we entered the eleventh Corcoran staggered, almost, to his customary position at the centre of the ring but a ferocious left sent his legs stiffening to the ropes, he ducked and weaved but Garton kept on landing. A left hook, that trademark shot, forced Steve Gray to step in and halt the bout with Corcoran deemed to be taking too much punishment, Johnny Garton claimed the British welterweight strap with a breath-taking display of guts and glory via an eleventh round TKO. Umar Sadiq and Zak Chelli – three and four fights without defeat, respectively – were pitting their unbeaten records against each-other over the course of a scheduled eight rounds in a genuine 50-50 fight. Chelli, the more explosive of the two, began the fight in the centre of the ring as he bounced in and out of the pocket before landing some right hands to the body of Sadiq – Chelli looked relaxed in his body language and comfortable in his footwork but Sadiq, himself, was staying busy with his footwork, staying at range. A positive start from Chelli, still in full-time education, who retained the higher work rate whilst staying patient and composed in the process – the mild-mannered man was landing full-blooded right hands, seeking to unload with real bad inentions. Sadiq, 10 years the elder fighter, looked to grow into the fight as he landed the rangy left hand with an increased frequency though an argument could be made for him using the jab more often in order to disrupt the rhythm of his, more combative, opponent. Towards the halfway stage we went and Chelli maintained the more aggressive fight style but Sadiq was landing with more consistency now and landed a decent right hand as the bout began to warm up – a tepid start from the older fighter, an incredibly down-to-earth man, but things were starting to heat up as Sadiq began to push forward on his lead foot. Neither fighter was landing with arrow-like precision but the sixth round saw a delightful over-hand right connect from Chelli, a punch that Sadiq walked onto in the process of trying to land a heavy shot of his own, and dropped his man to the canvas but the thirty year old shock it off, got back up and straight back into the fight. Around forty-five seconds later, the Ilford man landed a strong over-hand right of his own with Chelli scampering around the ropes. A nip-and-tuck fight in which neither man solidified their individual advantages, it was Chelli who fought the more aggressive fight but, as rounds went on, Sadiq started to come forward more and walk his opponent down, popping out shots more frequently and bringing the pace of the bout back into his control. The eight round saw the Umar Sadiq that many expected to see emerge as he began to impose a physically-commanding gameplan on that of Chelli, bullying his man around the ring, trading leather before a smacking left hook from Chelli, in the final seconds, saw the tide turn and the 20 year old began to unfurl an endless parade of shots, trying to take Sadiq out, but the bell rang to signal the end of a cracking eight rounds between two classy, classy, super-middleweights. Zak Chelli won the bout by 77 points to 74 on the scorecard of Chas Coakley but that only just begun to whet the appetite… a rematch, for the vacant Southern Area belt, has surely got to be on the table? It’s fair to say that the headlining fight as underwhelming, it was always going to be, but boy we were treated to some cracking fights on the undercard – Johnny Garton, he’s been patient, he’s bided his time, but now it’s his opportunity to seize everything that his talent and heart will bring.